HOURS — 1st and 3rd Saturday of each month — 10:00 AM to 3:00 PM. Please separate clean brush (tree branches, shrubbery, etc.) from other yard waste (lawn clippings, leaves, etc.). Follow the signs that are posted to deposit the materials at the proper site. Electronics are not accepted at the site. But, Best Buy in FdL will recycle your computers, or lap tops for free. However, you must remove the hard drive. If they remove it, they will charge you. Best Buy will recycle your TVs (32” or under) and computer monitor screens for a $10.00 fee and they will give you a $10.00 gift card. Dumpsters are either ‘Recyclable’ or ‘Non-recyclable’. Please separate. Effective January 1, 2010, the Town will accept all batteries: auto, tractor, lawn mower, etc. as well as cell phone batteries, AA, C, D, etc. Keep the batteries separated from the rest of the trash. Containers will be available. Area Boy Scouts still collect newspaper. They ask that you please separate newsprint from glossy paper and cardboard and tie it together or place in brown paper bags. Please support them. Thank You. Tires and waste oil are not accepted at the dump site. Schrage Bros, Mt. Calvary will accept tires. A fee is required. Waste oil is accepted at Stenz Auto Body, Schrage Bros, or Meinert Tractor Repair. There is a large dumpster for steel items. Continue to separate aluminum cans from the rest of the trash. Refrigerators/air conditioners/freezers with Freon line intact, should be put into the large dumpster for steel/iron items. Businesses are required to provide their own business disposals. If you are planning on doing a large renovation project, please obtain your own dumpster. 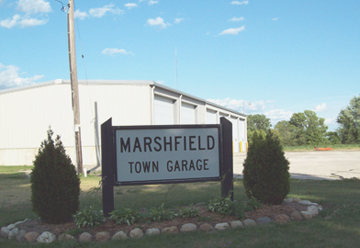 The dump custodian has the authority to refuse any material not in compliance with dump rules, or any material that is not generated within the Town of Marshfield.